In the early nineteenth century, light alloys like aluminium cost more than gold. At the time, light alloys were revolutionary materials, offering engineers exceptional strength in a material that didn’t weigh that much compared to conventional heavy metals. But early in the 1920’s, when new applications started pushing the limits of uncoated alloys, engineers were continually encountering problems, in the form of corrosion and wear. Anodising found its first commercial use in sea planes. These amphibious aircraft needed to be both light enough to perform well in the air, and corrosion resistant in the aqueous environments where they take off and land. To tackle the issue, engineers coated Duralumin–an aluminium alloy containing copper–through anodising. The very principles of that technique are still used today. But as the world’s looking to fly farther, drive quicker, and work harder––all while being more economical and environmentally friendly––the industry has begun looking at new techniques. Hard anodising has become popular in recent times, but advanced coatings like plasma electrolytic oxidation (PEO) are truly making waves. But how are these new, ‘advanced’ coatings improving upon the tried-and-tested techniques? Plasma electrolytic oxidation was first deployed by the former USSR. At the crux of the twentieth-century space race, they used it to coat the Mir space station. This novel technology played a fundamental role in ensuring the missions longevity: where the satellite spent 15 years in low-Earth orbit. So, what was it that caused them to use this new coating? PEO coatings are characterized by their ultra-hard surface, high electrical insulation, and enhanced corrosion protection. This advanced protection is created through a unique processing methodology, which builds upon the foundations that made anodizing the go-to solution for so many years. Electrolytic oxidation, A.K.A. anodizing, is the foundation upon which PEO coatings are made. A component is submerged in an electrolyte bath, from where the part is oxidized. The exact composition of this electrolyte bath is what makes the process unique, as the bath composition determines the resultant coating characteristics. These are free from chrome and other heavy metals, which makes them easily disposable. In hard anodizing, these baths employ sulphuric acids, which can be expensive to dispose of safely. Higher voltages and different electrical regimes are used in the processing methodology for PEO. This helps create plasma discharges, which modifies the coating during the growth process. While this is much like the traditional anodizing process, there are some crucial differences. For one, PEO uses much higher voltages than anodizing, creating plasma discharges at the surface of the metal that lead to a ceramic surface coating. Plasma often causes crystallization, introducing micro- and Nano-crystals on the oxide layer. Introducing crystals into the surface coating markedly increases the hardness of the protective layer –– up to four times harder than comparable hard anodized coatings. This means PEO can markedly improve performance in wear and thermal applications. Traditional anodizing has been an incredible breakthrough in improving the wear resistance of metals, but that’s not to say it couldn’t be improved upon. In some instances, anodic oxide layers can form with cracks, making them susceptible to extreme temperature changes. With the new PEO technique, the microstructure oxidized coatings take on an irregular form that protects from them cracking and improves performance during extreme temperatures. In fact, through its combination of high hardness, strong adhesion and compliance, PEO can deliver a coating offering exceptional wear resistance. In respect to corrosion, PEO’s inert ceramic structure provides excellent natural chemical stability and corrosion protection. Coatings have exceeded upwards of 2,000 hours in salt spray testing without corrosion, against traditional anodizing lasting just 200 hours. PEO also provides unrivalled Cr-free corrosion protection for magnesium alloys, which is why Keronite coatings are now widely used by many of the world’s leading motorsport teams, including F1 teams. While anodizing has been deemed environmentally safe by industry regulators, waste products from the anodizing process are extremely hazardous, if non-toxic. Aluminum hydroxide and degraded sulphuric acid are created during anodizing, which both create fumes that are harmful to workers and the environment and are difficult to process safely. With PEO, on the other hand, coatings tick every regulatory box, with there being no organic compounds, VOCs, strong acids, heavy metals use during the process. PEO uses 99% distilled water and creates no toxic waste products. In fact, the leftover byproducts are no more hazardous than run-off water from a domestic washing machine. Keronite are creating some of the world's most advanced surface coatings through plasma electrolytic oxidation, producing hard, ceramic coatings with an array of unique properties precisely developed for exacting applications. 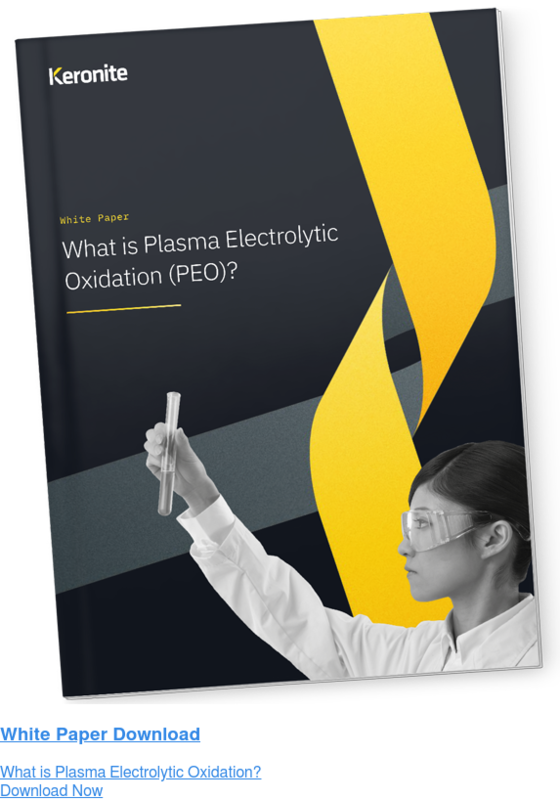 Download the guide to learn more about this advanced surface coating technology, the coating characteristics and a breakdown of how PEO coatings compare with hard anodized ones in the free white paper – 'What is Plasma Electrolytic Oxidation? '.